Vice President Joe Biden announced Friday a plan to allow U.S. parents here legally to apply for their Central American children to join them in the hope of preventing a crisis as was seen this summer when more than 68,000 migrant children arrived at the country's southern border. 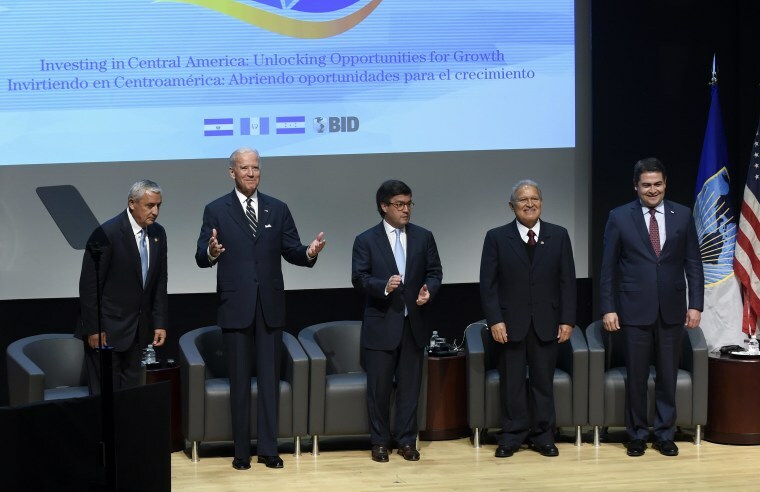 The announcement came in an appearance by Biden with the presidents of Honduras, Guatemala and El Salvador at the Inter-American Development Bank conference on investing in Central America. The crush of children that arrived from violence-ravaged Central America put a strain on border inspection centers and forced the administration to open emergency shelters around the country. The children's presence sparked protests from anti-immigrant groups and communities, including in Marrietta, Calif., where protesters blocked a bus of children and families being transported to an immigration center, forcing the bus to turn back. Other communities, such as Dallas, provided housing and assistance for them. Beginning next month, a parent whose child is still in one of the three countries can file an official request with the State Department asking for refugee resettlement for someone under 21 years old from any of the three countries. If the child of the parent in the U.S. lives with a second parent in one of the three Central American countries, that parent also could be included in the petition for resettlement. Children who are denied refugee status but are still in danger may be eligible for "parole" into the country. The State Department said forms for requesting resettlement will only be available through designated resettlement agencies in 180 communities in the U.S. In a statement on its website, the State Department said a relatively small number of Central American children are expected to get refugee status. The U.S. has only 4,000 slots allotted for refugees from Latin America, which includes Cubans, for whom entry as a refugee to the U.S. is easier. The administration took tough measures to stem the arrivals of the children and of families, which also spiked, including reversing a policy of allowing women and children to remain in the country while awaiting deportation hearings. Detention centers have been opened in Texas and New Mexico to house children and families. Some families were returned to their countries. The latest numbers show a 40 percent drop in children's border crossings at the start of the fiscal year. GOP House Judiciary Committee Chairman Bob Goodlatte criticized the plan. "The policy announced by the Obama Administration today is simply a government-sanctioned border surge," Goodlatte said. The announcement comes as many immigrants illegally in the U.S. are waiting on President Barack Obama to take executive action on immigration.